SPRINGFIELD, IL (KFVS) - After years of trying to clear the name of man who arrested, tried and convicted for the stabbing of a 72-year-old Mt. Vernon, Illinois woman, Grover Thompson has received executive clemency. 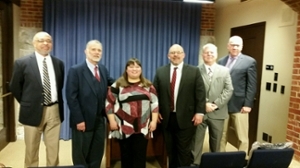 At the Illinois State Capitol on Tuesday, January 15 at 2 p.m., the University of Illinois Springfield Illinois Innocence Project held a news conference on Thompson’s exoneration. Heartland News was at the news conference held in Springfield on Tuesday afternoon, Jan. 15. Read more about the Downstate Illinois Innocence Project here. Read about the SIU Illinois Innocence Project Externship here.